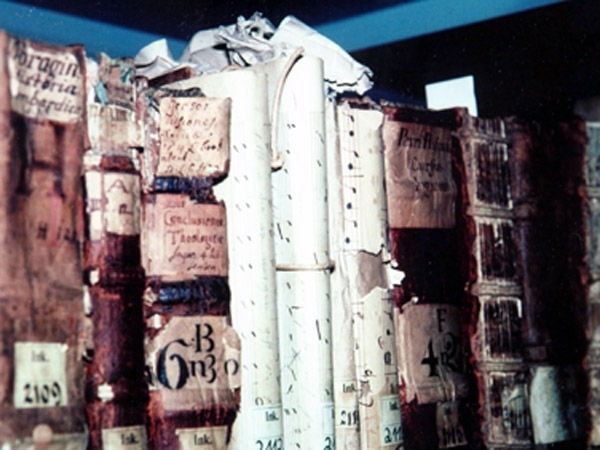 However, on many of these volumes the high age of over 500 years has left its mark: Book covers are missing, backs of invention books are broken, pages have become loose or have completely detached from the book block, in short; many incunabula of the Gutenberg Museum were at risk in their substance. (fig.1). The restoration of all affected pieces could only be done gradually, thus we favoured a preservation solution, which allowed us to pack damaged and endangered books in an ideal way. While choosing the appropriate conservational packaging we remembered our positive experiences made in 2004/2005 with KLUG-CONSERVATION. 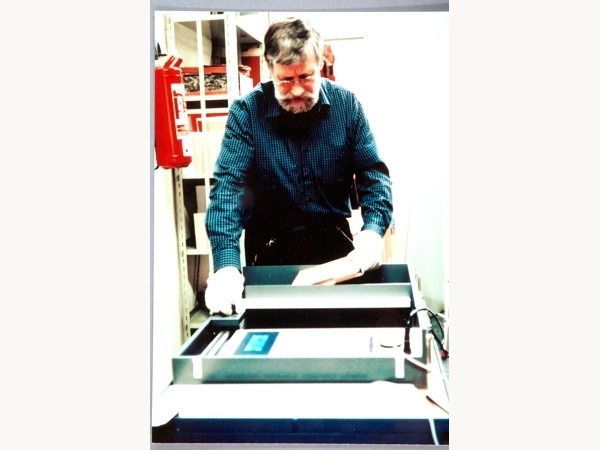 They had manufactured individual protective packaging boxes for the Gutenberg Museum made of acid-free board for its 1,500 press prints and art books, thereby improving the storage conditions significantly. and raptures. The boxes prevent such access and thus further. 2. 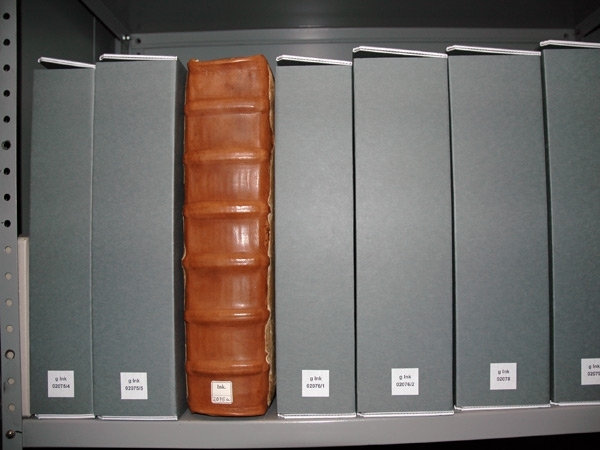 The volumes are also protected during transportation to the reading room or if they are out on loan. 3. The book covers can no longer be scratched by metal parts of adjacent wooden book covers. 4. The volumes are not exposed to light and gather less dust. 5. Loosened cover parts such as torn covers or loose sheets and layers remain with the volumes and are not lost. Previous generations had already recognized this risk; in the Gutenberg Museum for example archivists resorted, in a time of limited material options, to wrapping the volumes in old note paper and tying them together with cord (fig. 2). AOn the other hand, packing the entire collection has many disadvantages, which is frequently mentioned by librarians and researchers: Information is written on the books’ spine, which visually quickly conveys information about its provenance. Through packaging it is no longer to be seen. To compensate for this disadvantage, the entire inventory was digitally photographed shelf-wise. This way, the book rows could be walked down virtually on the computer. Another fundamental problem was that the packaging increases height and width on each book. Therefore, many books did not fit into their original shelf compartments and more shelf meters were required. Of course, at the beginning of our planning there was the question of financing such a project. Since we could not cover the cost with our normal budget, the cost of this project had to be requested at the city authorities of Mainz, responsible for our museum. In order to do this we needed a clear concept of the box types required and consequently a price estimate. One also had to consider how the packing of 3,000 incunabula into boxes, considering the limited staff available, could be carried out organisationally and logistically. 1. Next to the measuring, a revision of the stocks had to be made. 2. 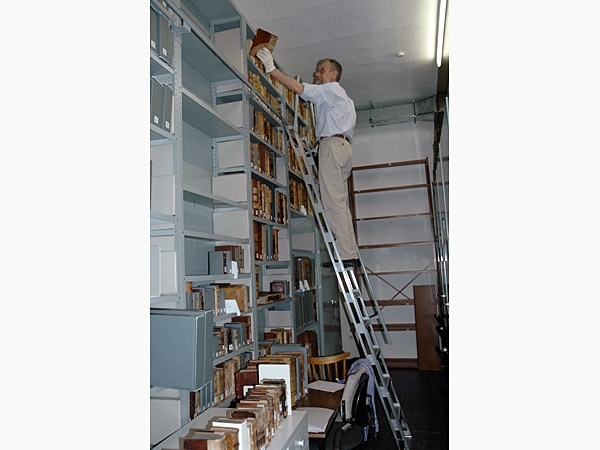 In order to increase the safety of our employees on the ladder, which was now definitely higher, we decided to place the smaller sized books on the top shelves (fig. 3). We accomplished this by dividing the new boxes into two groups, labelling them "large" and "small" (up to 25 cm). This would also help to make better use of shelf space. However, with this new arrangement came significant additional work since the stock had to be re-arranged intensively. Of course, when “boxing” a change of order to the rack systems will never be completely avoided, because the boxes increase space requirement anyway. 3. In addition, the books presented in the permanent exhibition at the museum should also have their protective boxes and thus their space in the shelves in case of any transportation or exhibition changes. For this extra shelf space had to be reserved. The first actual step towards the realisation of our project took place after our initial contact with KLUG-CONSERVATION. In May 2006, during the visit of one of the employees at the works of KLUG-CONSERAVTION, we discussed about suitable box types from their diverse box product range. Among the incunabula there are many original wood-covered books from small octaves to extensive heavy folios. But there are also small narrow hardbacks of dissolved anthologies (fig. 4). We chose different boxes depending on the size: expansion folders should be made for books with a spine width less than 25 mm, and for wider spines KS 3, KS 17 and KS 17 "Trier" boxes should be used. We measured a few books to test the various box types. KLUG-CONSERVATION provided us with box samples to test the object fitting. In this way we were able to adjust the box types it meet our individual requirements. For example the particularly sturdy box type KS 17 "Trier" is offered with ribbons, but we found the tying of the ribbons time consuming and unnecessary. So we decided against this addition. Or the other hand, the KS 3 box type is available as a custom-made box without slits and we preferred this special compact design. 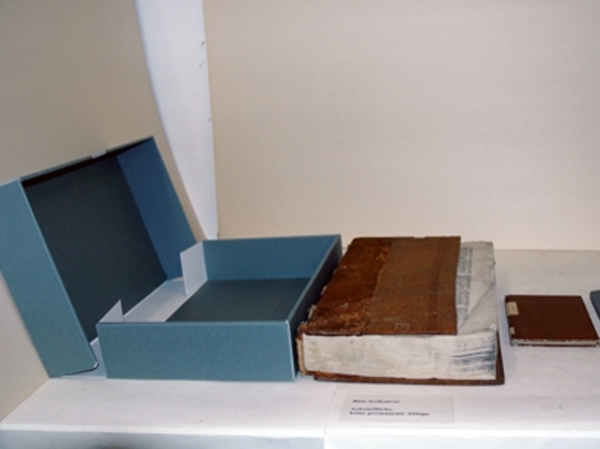 The type of box which would be used was decided by width and height, the Trier box for example encloses a specimen with a book height exceeding 35 cm and a spine width exceeding 3 cm. 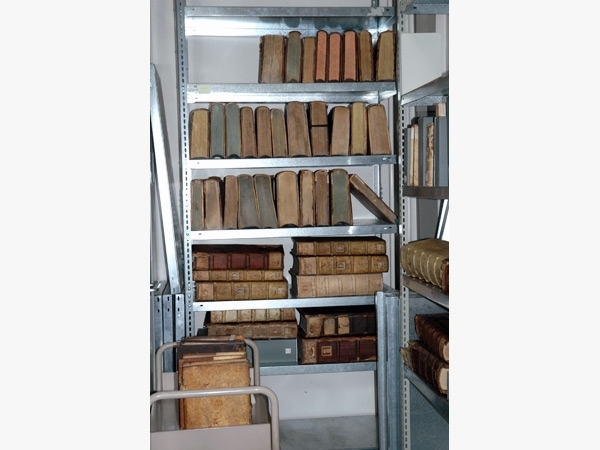 In this way we did not have to decide which box type was necessary for each particular book, since KLUG-CONSERVATION provided us with the correct classification according to the measurements. The selection of the box types was an important factor in calculating the budget, considering expansion folders are much cheaper than a Trier box. KLUG-CONSERVATION personnel accurately advised us competently, with a trained eye, the estimate of the proportion of small or large book volumes of the total collection. In the cost estimate we also integrated various other details: Because of a shortage of employees on our side we could not take over the job of folding and erecting the boxes, so we additionally bought this service from KLUG-CONSERVATION, which in turn increased transportation costs. Furthermore, signature labels had to be made (labels printed on special label paper to sizes defined by us) to put on to the protective boxes. We received an additional set of signature labels for the unsigned book volumes. For logistical reasons, we also agreed to partial deliveries of 500 boxes, as we could not store the complete supply of 3,000 boxes. In December 2006, this project was applied for at the city of Mainz, being responsible for the Gutenberg Museum. A partial solution had also been discussed with the company KLUG-CONSERVATION, provided only part of the requested budget should be approved. Fortunately, 2008 saw the start of the project when the funding for the entire project was approved for. The first step was the measurement of all books, each of which would be provided with a box. For this purpose KLUG-CONSERVATION lent us a measuring device, which was delivered in April 2008 by courier. The device has an automated measuring system in which a book is laid in, its signature is typed in on a computer keyboard, and then the three required dimensions (height, width and thickness) are accepted with the return key (fig. 5). For practical reasons, this operation should always be carried out by two employees. One hindrance was that once one completes a measurement procedure it is no longer correctable. On the other hand, it prevents the backup data from getting mixed up. Since all the books had to be taken up by hand anyway, we linked the measurement of the incunabula with a revision, even if it resulted in the delay of the measuring. Hereby, we researched noticed ambiguities and noted particularly worn copies, so that they could be restored as soon as possible. Our work became complicated due to the fact that the entire "boxing action" was carried out while the collection was in use and researched with. This required patience and cooperation of all colleagues, but also the users of our library, especially while the boxes were filed and placed erratically for a short while. Another problem occurred with the books on display in our museum. They were measured on-the-spot on visitor-free days. Here, we worked in threes because the books had to be positioned and fixed again in the show case. These measurement results were then added to the data list of the stored collection to keep the exact order of signatures. Measuring and revision took over three months. KLUG-CONSERVATION proved very obliging as they let us calmly perform this important step, even though we blocked the measuring device of the company. Upon damage they also provided us with a new device. As a precaution, a KLUG employee had also helped us with our first measurements. After completing our measurements KLUG-CONSERVATION took over the data, organized it in excel charts, sent the tables to us for checking and defined the box types for production on the base of the measurement results. Finally, in early August the first two man-high pallets with 500 boxes arrived in Mainz (fig. 6). Our storeroom even offered shelf space for the additional space required by the boxes from KLUG-CONSERVATION, but at the end of the line-up. Since our incunabula are arranged in different signature groups, we moved the first signature groups to the back, so we were able to create space at the front. If such a re-arrangement cannot take place in other collections then all the books should be moved to the back in order to make room for the books in the boxes at the front. If one cannot provide shelf space in this way, volumes will be left over on each row accumulating and becoming confusing. We curiously began to unpack the first pallet. As a matter of fact the boxes made of board material were packed in the correct order so that we, unlike the packaging employees of KLUG-CONSERVATION, could begin at figure 1. This may sound rather unimportant, but with a number of 3,000 pieces a reliable order does plays a significant role (fig. 7). Our new assembly revealed another hurdle; the height of the shelves had to be adjusted, which resulted in the books being separately housed in two different sizes. The remounting of boards of our old shelves proved to be the most time consuming step. A modern shelving system with hooking shelves would have saved many hours of work and some awkward work positions (fig. 8). We also joined the actual packing of the books with an additional conservational work process: the book care. 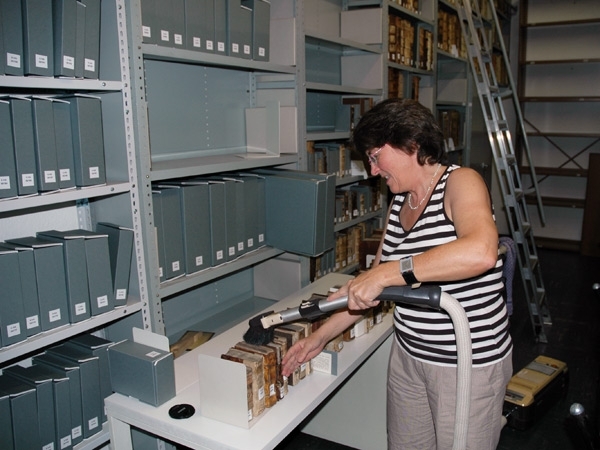 After the empty and adjusted shelves had been cleaned, we packed the books on to a work table, pressed the head section together and hoovered it (fig. 9). Finally, the cleaned books could be put into the boxes and folders and be positioned in their final place. 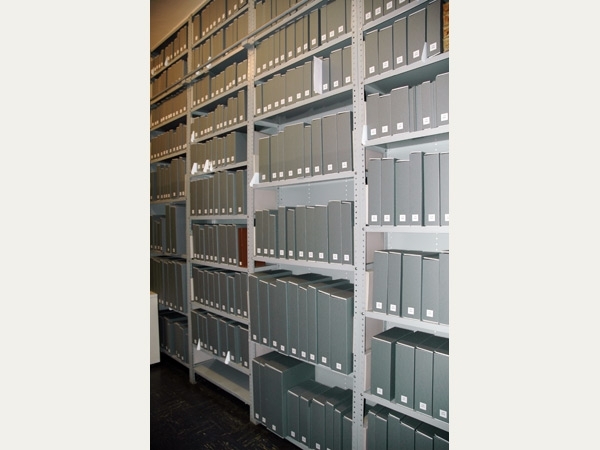 KLUG-CONSERVATION produced archival boxes perfectly fitting the huge amount of data and dimensions fed in by us over weeks. All false sizes were due to measurement error for example because the register was still in motion while the measure had already been fixed by pressing the return key – and not because of production errors, which we were able to validate by the measurement tables. 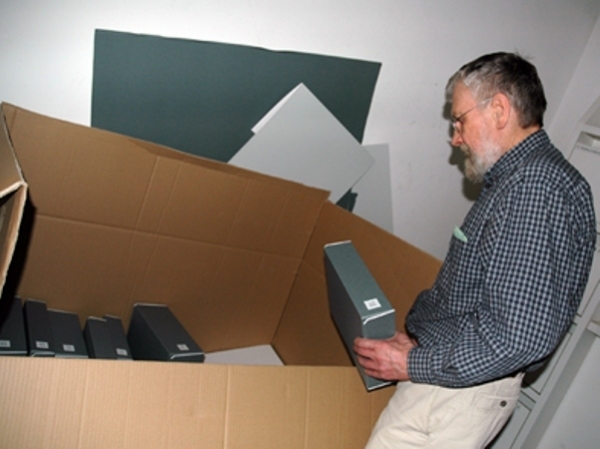 In our first talks KLUG-CONSERVATION had assured us they would replace the unfitting boxes at the end of the process. This also applied to the two books that accidently did not get measured and were now lying without a boxing "naked and bare" between the packed incunabula (fig. 11). On the other hand, we were also proud of the praise company KLUG-CONSERVATION paid us on our measurement accuracy, because this last correction affected only eight books. Just in time for the end of 2008 we could process the last of six deliveries amounting to 4 pallets. 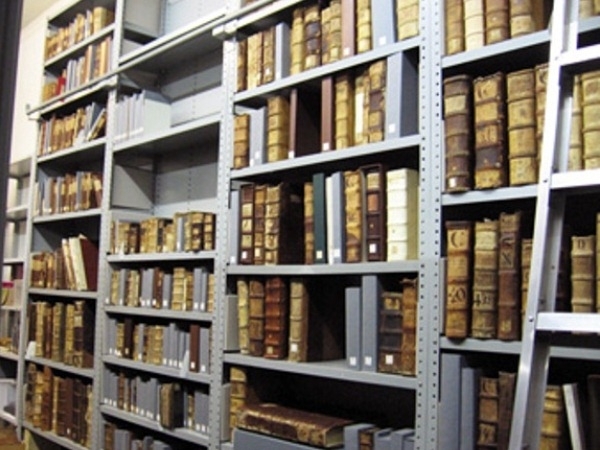 Contrary to my concerns, we could store the whole incunabula collection easily, even storage space for loan inventories and the collection of documents could be maintained. Now the entire stock of 3,000 incunabula is stored in customized protective boxes. Although the unique sight and the flair of the old book spines in our storeroom has now been lost (fig. 12), this project preserves our collection for future generations, as preservation work due to possible future mechanical stresses will be avoided. Thereby, I have achieved a major goal of my conservation work at the Gutenberg Museum. I thank the representatives of the city of Mainz for their acknowledgment of the significance of the incunabula collection and the necessary financial resources. Also, I would like to thank my colleagues for their understanding and dedicated participation, my special gratitude towards the company KLUG-CONSERVATION for their support and always helpful and friendly cooperation in this project. Annette Lang-Edwards, book conservator at the Gutenberg Museum in Mainz, in February 2009.